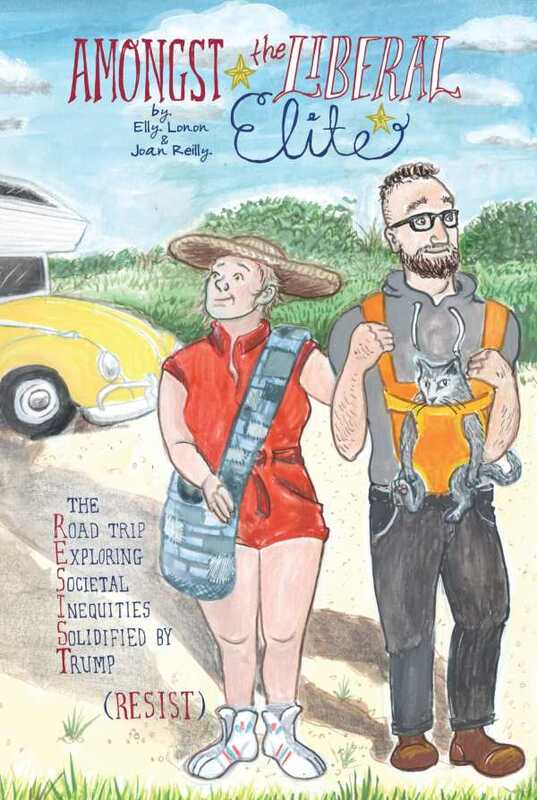 A politically minded couple embarks on a semiambitious cross-country road trip in the comedic graphic novel Amongst the Liberal Elite. Armed with a tax refund, the liberal-leaning Michael and Alex, along with their cat Kittery (who’s sometimes carried in a Baby Bjorn–type apparatus), decide to “reconnect with America” by visiting kitschy tourist sites, including several claiming to have the world’s largest frying pan or ball of twine. As an aid to their understanding Trump voters, this might seem a bit condescending and naïve, but luckily, that’s the point. Based on her continuing prose feature in McSweeney’s Internet Tendency, Elly Lonon pokes fun at liberals’ speech and behaviors while being completely sympathetic to their cause. Michael and Alex are well-intentioned, sometimes admirable, sometimes annoying fictional characters who seem very real, down to their social media obsessions, complete with a recurring, convincingly depicted Instagram feed and hashtags. There are a lot of political references, many of which might quickly pass (or have passed) their expiration date—Amongst the Liberal Elite is very much an of-the-moment publication. But even so, the general paranoia and guilt of the two main characters as they vigilantly guard against anything resembling racism, misogyny, or political incorrectness, even in themselves, is both amusing and heartwarming. Reilly’s black-and-white art is up to the task of documenting the trip, with equal attention paid to the subtleties of facial expressions and physical gestures and the distinct lack of subtlety of roadside curiosities. While “red voters” might not find as much humor in Amongst the Liberal Elite, those who lean left will find plenty of self-deprecating laughs that resonate.